To begin, I would like to thank Mary from Delacorte Press for providing me this ARC of Reawakened. Because this is an ARC, some of the aspects I talk about below might not be the same for the copies readers receive after publication. Fans of Colleen Houck's The Tiger Saga will not be disappointed with this first installment of her new Egyptian mythology series, The Reawakened. Reawakened was packed with intriguing mythology and mystery, exciting travels, an intimate list of characters with diverse traits, and forbidden romance. Overall, I enjoyed the story that was told, but my expectations exceeded the results. It's been three years since I read The Tiger Saga and I think what I look for in a paranormal-adventure-romance story has shifted. I'll go into a little detail below on a few of the aspects I mentioned above, but to anyone who has read Tiger's Curse recently or still adores these types of paranormal-romance-adventures, you will love Reawakened too! I loved the heart of the mythology and how Houck weaved it into the plot, but it also bogged down the story a little when the beginning of the book (and other sections) were showered with a list of Egyptian gods. From the little I know about Egyptian mythology, it is quite complicated, and I applaud Houck for tackling this subject, but some parts were a little hard for me to grasp with everything else going on. The adventure and setting in New York and Egypt were vivid and some of my favorite parts. The action sequences were written similar to how they were in Houck's original series: like a video game with the characters moving from one room of trials to the next before they faced the big battle. This set up made the plot easy to follow, especially with Houck's strength in setting description, but it made the plot feel too structured for me and I personally wish there had been more spontaneity. As for the characters, readers could draw distinct lines of similarity between specific characters in both series, but there was enough differentiation between them to make each character their own. Unlike Kelsey, Lilliana was sarcastic and defiant, but her sarcasm struck me the wrong way. Her words and actions reflected her personality, but I didn't enjoy her snide comments or banter like I have with other sarcastic heroines/heroes. I liked the three Egyptian brothers (not a spoiler) and their interactions with Kelsey. It was a nice dynamic, but one I've seen before so it wasn't a game changer for me. My favorite interactions revolved around little moments Amon and Kelsey shared as Amon tried adjusting to modern-day life. The most redeeming aspect of Reawakened was the pace. I grew very familiar with our lead heroine and the setting right off the bat. By the end of the first chapter, the mythology was already introduced and from there, the plot continued to steadily build. Despite any divots along the way, Houck's quick writing style allowed me to hop over them and flip through the 400 pages at a decent pace. 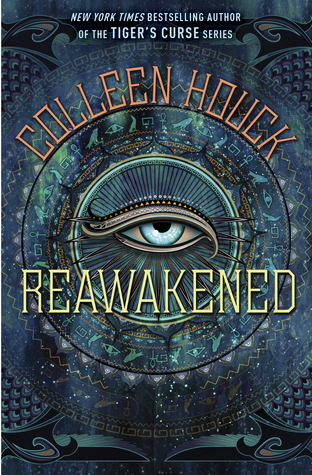 Reawakened was true to Colleen Houck previous work and I recommend fans of her tigers books to pick this one up too.